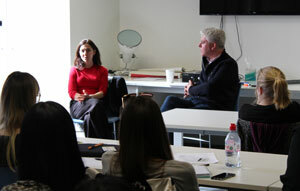 In March 2017, Diana Verde Nieto, Co-Founder and CEO Positive Luxury, visited GCU London campus to provide a guest talk as part of the MBA Luxury Brand Management course. Her talk focused on how sustainability is developing within the global luxury industry. Diana observed: “This is the first time in history that we have four different generations in the work place together. Clever CEOs use reverse-mentoring and get younger people in the work place knocking at the boardroom saying ‘hey how about this or that”. She explained about how Sustainable Development is at the CORE of ‘Good Business’ and is the impact needed to achieve a competitive advantage. Diana also talked about Positive Luxury’s ‘2017 Trends’ report, sharing and discussing key insights about what is likely to happen this year. For further information, please download a copy of Tim Jackson’s report on the Bloomberg conference ‘Good Business’ for Positive Luxury.